With his brother’s birthday on his mind, DeAndre’ Bembry sobbed in the locker room before an Atlanta Hawks practice that the team ultimately decided to give him off. Dec. 15, 2016, was an off day between two home games for the Hawks. A light practice was expected in preparation for the arrival of the Philadelphia 76ers the next night. It also marked the 21st birthday of the then-rookie guard’s late brother, Adrian Potts, who was shot and killed six months earlier. Bembry and Potts grew up in Charlotte, North Carolina, in the Beatties Ford Road area, which ranked No. 1 in Charlotte in 2014 for violent crimes. The brothers of different fathers were raised primarily by their mother, Essence Bembry, who moved them to New Jersey for high school. Bembry earned a basketball scholarship to Saint Joseph’s University in Philadelphia. Potts was often on campus visiting his brother until he began attending North Carolina Central University in Durham. During his final season with Saint Joe’s, Bembry averaged 17.4 points and 7.8 rebounds as a junior in 2015-16. He earned 2016 Atlantic-10 Conference Player of the Year honors. Potts was in Spokane, Washington, when Saint Joe’s played Cincinnati and Oregon in the NCAA tournament in March 2016, marking the final games of his brother’s college basketball career. 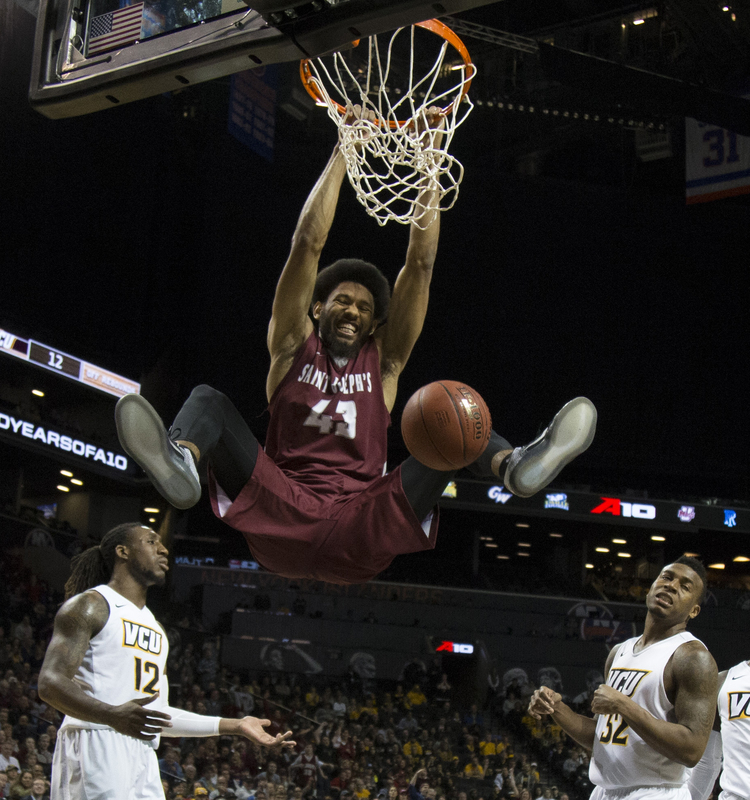 DeAndre Bembry played for the Saint Joseph’s Hawks, averaging 15.7 points and 6.7 rebounds. Potts planned to be sitting alongside his brother as they watched the NBA draft on June 23, 2016. Potts helped plan the draft party with his mother. Martelli had a strong respect for the love that Potts and Bembry shared. “It was evident from the very beginning that that wasn’t DeAndre’s brother. That was DeAndre’s best friend,” Martelli said. Essence Bembry said she went to sleep early on June 10, 2016, at her Union, New Jersey, home and didn’t call Potts that night as she normally would. Bembry said she awoke to a phone call about 2 a.m. the next morning from Potts’ father, Rodney Potts. She received the news that 20-year-old Potts was shot and killed near the University of North Carolina, Charlotte campus. According to the Philadelphia Inquirer, three other people were shot and wounded in the early morning altercation at a party. The Bembrys said Potts was attempting to be a peacemaker. “It was evident from the very beginning that, that wasn’t DeAndre’s brother. That was DeAndre’s best friend,” Martelli said. Bembry could sense something was wrong from his mother’s frantic tone. He entered her bedroom, took the phone and learned of the heartbreaking news. Bembry and his mother were crying and in shock. “He was at a party and somebody came by [shooting], and a few others got shot as well,” Bembry said. “And he was just left at the scene. And that’s all [Rodney Potts] said. And, I pretty much didn’t have nothing else to say to him. I just didn’t want to believe it. “The family is cooperating, witnesses are being located, and forensic information and details are being uncovered on a continuing basis,” Guthrie said. “However, no further information is available as far as the specific development and status of the matter. It wouldn’t be appropriate to identify that there are persons of interest presently. However, there’s not a specific person that’s being charged. Until that actually happens, it wouldn’t be appropriate to go any further into details regarding that. Bembry has not been asking for updates in the case, nor is he determined to find the killer. Bembry’s agent, Adam Pensack, said about five workouts with NBA teams were canceled for his client because of the death of his brother. One was a workout with the Chicago Bulls against then-Michigan State guard Denzel Valentine. The Bulls ended up drafting Valentine with the 14th overall pick in 2016. A workout for the Indiana Pacers was also canceled. Indiana also drafted a shooting guard in Michigan’s Caris LeVert with the 20th pick. A workout with the Toronto Raptors, owners of the ninth and 28th picks, was also canceled. With Bembry in mourning, the last thing Pensack was going to do was push his client to work out for teams to help improve his draft stock. Among the workouts Bembry did take part in before his brother died was a productive one with the Hawks, who had the 21st pick. “We were trying to work out for teams at the back end of the lottery and throughout the first round in the early 20s,” Pensack said. Pensack said Bembry was not invited to the 2016 NBA draft’s green room, which typically includes the top 20 widely projected draft picks. Bembry could have attended, but he would have had to sit in the stands at Barclays Center in Brooklyn, New York. While many first- and second-round picks had done that in the past, Bembry declined. Instead, he and about 60 family members and friends were in a New Jersey hotel ballroom not far from the draft. Emotions were high because of the uncertainty of where Bembry would be selected and Potts’ recent death. Bembry knew of the Hawks’ interest in him. And when then-general manager Wes Wilcox and head coach Mike Budenholzer called to let Bembry know the Hawks had selected him at No. 21, it was a bittersweet moment. His childhood dream come true, Bembry had a quiet moment with his mother and grandmother in tribute to his brother before hugging his screaming family and friends. After celebrating, Bembry went to a room by himself and broke down. Bembry was used sparingly last season as a rookie, a defensive stopper who at times guarded NBA All-Stars LeBron James and James Harden. The bearded 6-foot-6, 210-pounder played in 38 games and averaged 2.7 points and 1.6 rebounds in 9.8 minutes per contest. He scored a season-high 10 points twice and spent time playing in the NBA’s G League. While Bembry tried to concentrate on basketball, he acknowledged it was difficult with his brother constantly on his mind. “He did his best, under the circumstances. I commend him a lot for that, to be honest with you,” Essence Bembry said. On his brother’s birthday, as he cried in the locker room, the Hawks told Bembry to take the rest of the day off. Rookie guard Taurean Prince consoled him before he left. Later that night, Bembry, his mother, his grandparents and other friends celebrated what would have been Potts’ 21st birthday in Atlanta. There was a birthday cake along with singing “Happy Birthday,” dancing and drinking. Essence Bembry sent candles to family members and friends who sent cards, brought food, donated money or attended Potts’ funeral. She asked that on Dec. 15, 2016, they all light a candle at 8 p.m. EST in honor of his birthday. 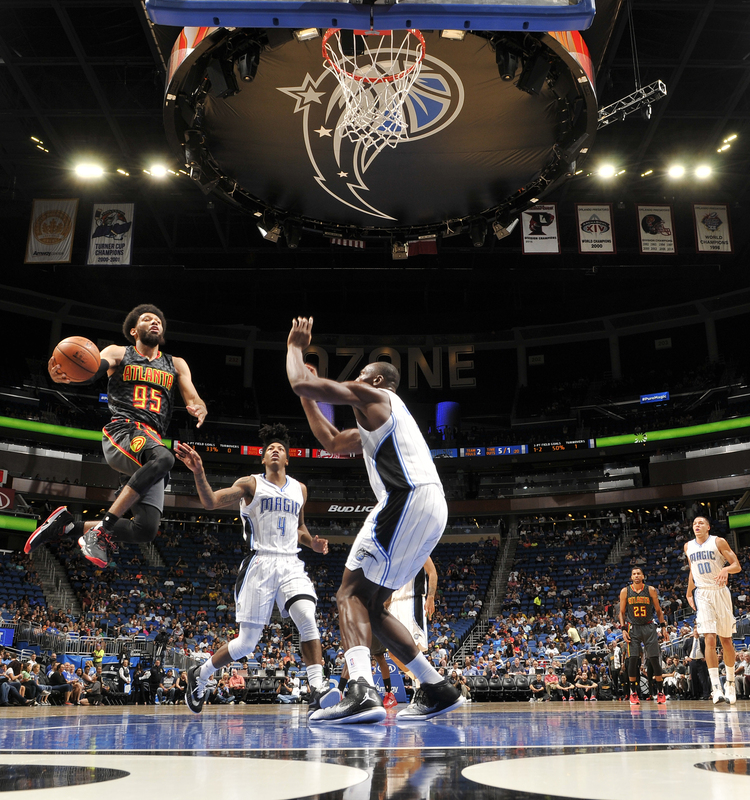 Bembry credits the Hawks for giving him strong support last season. The Bembrys said one person who helped tremendously was then-Hawks manager of basketball operations Malik Rose. The former NBA player was 13 years old when his 18-year-old brother, Mike, was shot and killed while partying on Temple University’s campus in Philadelphia in 1987. Rose, one of six siblings raised by a single mother, used his brother’s death as motivation to build a better life for himself and his family. The two-time NBA champion starred at Drexel University, played in the NBA for 13 seasons and is now an NBA team executive. Rose said he met Bembry and his mother after the 2016 NBA draft and told them about his brother being killed. Rose immediately built a bond with Bembry. “He definitely had his own mindset,” Bembry said. “He used to read a lot of Malcolm X books, Martin Luther King books and things like that. He had his own train of thought. He was in college, on the right path, wasn’t out there in the streets or anything like that. Bembry recently established a nonprofit organization called AP World (Adrian Potts World) that will serve Atlanta and Charlotte. The AP World mission statement is “to serve as a nucleus of support for surviving families of victims of gun violence by bridging resources, activities and support services designed to aid the healing process.” The National Basketball Players Association recently approved it and will match donations to AP World up to $20,000 a year. The goal of AP World is to host events that raise awareness, serve as a platform for the network of surviving families of victims of gun violence and earn resources to offer support for surviving families. Bembry is planning some speaking engagements to promote the AP World Mission. He recently hosted a youth basketball camp in Atlanta, and he also has hosted a camp in Charlotte and a gun violence barbecue. “I started a new [foundation] to try to stop gun violence,” Bembry said. “Just be aware of what you’re doing. Be cautious of life and who you’re shooting at. Just be cautious of what you’re doing and what a gun can do to not only that person but the family behind it. I’ve been trying not to think about it too much. … And it’s not just in Charlotte, because Charlotte’s nowhere near the worst city with gun violence. But I started it in Charlotte. Bembry averaged 17 points on 56.5 percent shooting, 3.5 rebounds, 3.3 assists and 2.8 steals during summer league. He figures to get more playing time this season, although he is behind Kent Bazemore and Prince at shooting guard. The Hawks announced Sept. 13 that Bembry would miss at least a month with a strained right triceps, but he returned to preseason action against the Detroit Pistons on Oct. 6. Bembry believes he will be mentally ready for the Hawks in his second season. DeAndre Bembry of the Atlanta Hawks goes up for a shot during a preseason game against the Orlando Magic on Oct. 16, 2016, at Amway Center in Orlando, Florida. “Playingwise, I’m definitely a lot more comfortable,” he said. “Just being in the NBA a whole year, you can gain so much knowledge and game on the court. Then off the court, dealing with what I was dealing with, a whole year has gone by, so I got to re-evaluate myself and get my mind right. Basketball helps with the pain that often returns during quiet times.